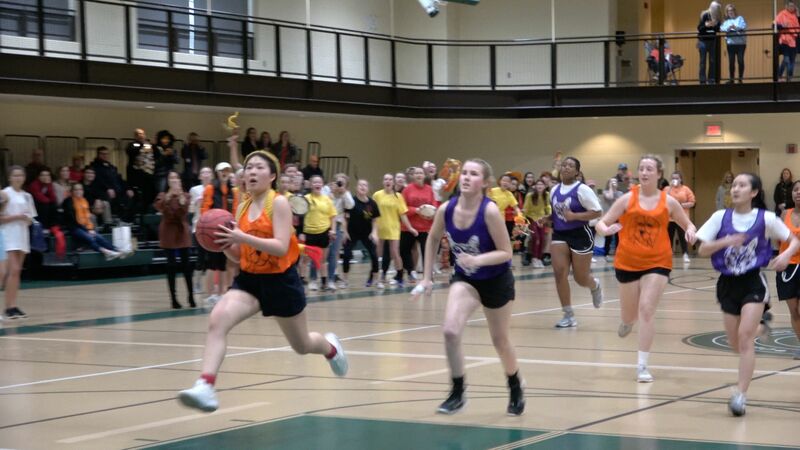 Leipheimer Gym was rocking Saturday when the Foxes and the Hounds met in their annual Battle for the Cup — aka Big Game. Students, faculty, alumnae, and parents were there in their colors; the drums were deafening and the cheers lively. 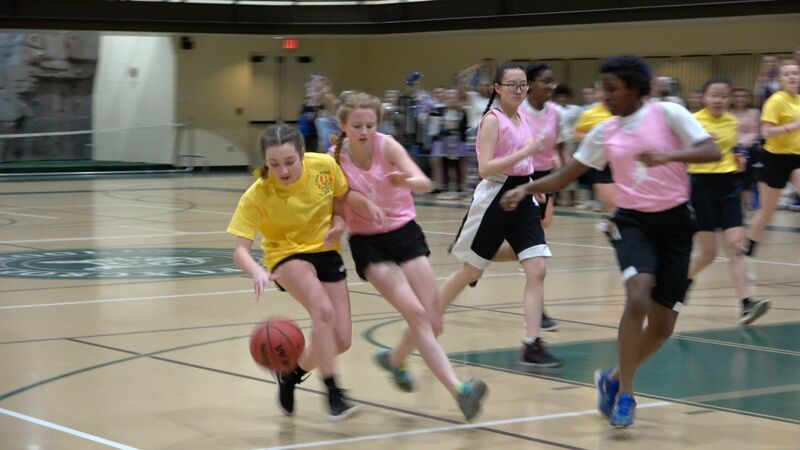 Enthusiasm along the sidelines was matched by the hustle and heart on the court. The new 11am start for Big Game changed nothing, including — unfortunately for the Foxes — the outcome. Led by All-Delaney Athletic Conference First Team selection (and Hound Cheerleader) Mia M. '18, the Hounds defeated the Foxes, 60-25, to hold on to The Cup for the fifth consecutive year. The victory completed a basketball sweep by the yellow and brown that began Friday with Little and Middle Game triumphs by the Hound Puppy and Stern teams. With four Varsity Team starters on their Big Team, the Hounds were heavy favorites, but the Foxes came out strong and took a stunning 5-0 lead at the start of Big Game. The Hounds finally got on the scoreboard with two free throws by Hound Captain Trinity P. '18 with 4:25 remaining in the first quarter. Three minutes later, Mia stole the ball and took it in for a layup that gave the Hounds their first lead of the game, 11-10, and they never looked back. The Hounds then outscored the Foxes 17-4 to take a 28-14 lead into intermission and dominated the second half. Mia finished with 21 points, two more than she scored a year ago. Trinity had 13 points and Big Team Captain Loren S. '19 scored six points and played outstanding defense. The Foxes got eight points each from Big Team Captain Leah S. '19 and Fox Captain Pia S. '18, who hit two three-point shots! The valiant Foxes were standouts in terms of heart, effort, and persistence as they battled to the very end with everything they had. And when it was all over, there were hugs and cheers for teammates and rivals alike as everyone celebrated the true meaning of the day — true friends through and to the end — and headed out to Spring Break. The spirited week began with Teas on Monday, dedicated practices all week, and the traditional Sing Sing/Morning Meeting in FoxHound on Friday. In the afternoon, the competition was passionate as Puppy Team, led by captains Ellen B. '21 and Larisa B. '20, bested the Cub Team, captained by Isabel W. '20 and Maria C. '19, by a score of 15-5. Stern Team Captain Willa C. '19 led the Hounds with six points while Captain Brianna M. '20 added three in the Hounds' 17-6 Middle Game victory over the Fox Middle team, led by junior captains Bailey R. and Annie Z.
Hounds keep The Cup with a Big Game victory! Congratulations to both teams for playing in the true spirit of Fox/Hound — true friends to the end. Enjoy photos from the weekend in the gallery below. Go Foxes! Go Hounds! On Friday morning, the community gathered in FoxHound Auditorium for a spirited Morning Meeting. The Hounds marched to the stage and belted out their cheers. . .
. . .and the Foxes responded with enthusiasm and plenty of spirit. Among the many songs that were sung that morning, there were tunes to the "Foxy Head" of School Cathy McGehee. . .
. . .and to her husband, Dr. Read McGehee, who retorted with a loud cheer of "GOOOO HOUNDS!" The Big Teams and officers sang songs with customized lyrics to their counterparts. . .
. . .and traded hugs and flowers. The Little and Middle games followed that afternoon. Scarlett D. '21 and her Foxy teammates played hard on the Court. Hound Susannah M. '21 shot a basket before the Foxes could intervene. Fox Betsy A. '21 had her sights set on the hoop as she went up for a layup. The Hounds came out victorious at the end of Little Game, 15-5! Captains Ellen B. '21 and Larisa B. '20 proudly showed off the Little Game trophy sporting yellow and brown ribbons. Candace K. '19, Emma L. '20, Chessa B. '21, and Ellie P. '20 had very important jobs during the games — keeping score and running the clock! Even the littlest fans came out to support their team. Rachel B. '18 helped Ronnie, son of Assistant to the Office of Student Life Josie Ross, show his Foxy pride. Fox Kayla L. '19 gave Choxy a good luck kiss before Middle Game got underway. The competition between the Foxes and Hounds was fierce in Middle Game! Fox Ify N. '19 held onto the ball while keeping Hound Middle Team Captain Willa C. '19 at bay. Eunice Y. '21 was in good shape to put up a basket for the Foxes. Elizabeth B. '19 and Meghan M. '20 made some noise from the Fox's side. . .
. . .while Semin A. '21 and Irene F. '19 kept up the spirit for the Hounds. Hound Middle Team Captain Brianna M. '20 had some tough Fox defense to get through en route to the basket! Ultimately the Hounds won Middle Game with a final score of 17-8. Willa and Brianna were happy to tie their Houndy ribbons on the Middle Game Cup. Sophomores Courtney B., Brianna M., Joy W., and Krissa T., and junior Irene F. sported plenty of Houndy orange, yellow, and red. During a chorus of cheers and songs, each team sang to alumnae in attendance. Clarke Betz '17 let out a resounding "Go Hounds!" at Big Sing Sing. Saturday morning, the Mary Louise Leipheimer Gymnasium was decked out with banners and signs. . .
. . .adding more excitement to the main event: the battle for The Cup! The ceremonies began with the traditional March In by both teams. Led by Foxy Fellow Alex Northrup and Fox Captain Pia S. '18, the Foxes came in first. . .
. . .followed by the Hounds, led by Hound Captain Trinity P. '18 and Hound Backer Patty Boswell. 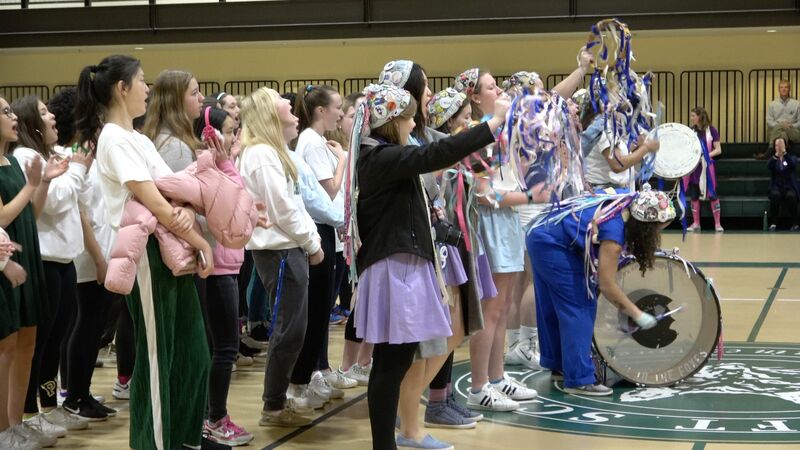 The rituals of March In, while they may seem odd, are revered by students and alumnae alike. Once both teams completed their solemn March In customs, the game was underway! Throughout the entirety of Big Game, both teams showed a tremendous amount of heart. Fox Big Team Captain Leah S. '19 gave it her all against Hound Cheerleader Mia M. '18, who led the Hounds with 21 points in Big Game. In addition to scoring six points for the Hounds, Big Team Captain Loren S. '19 played excellent defense. 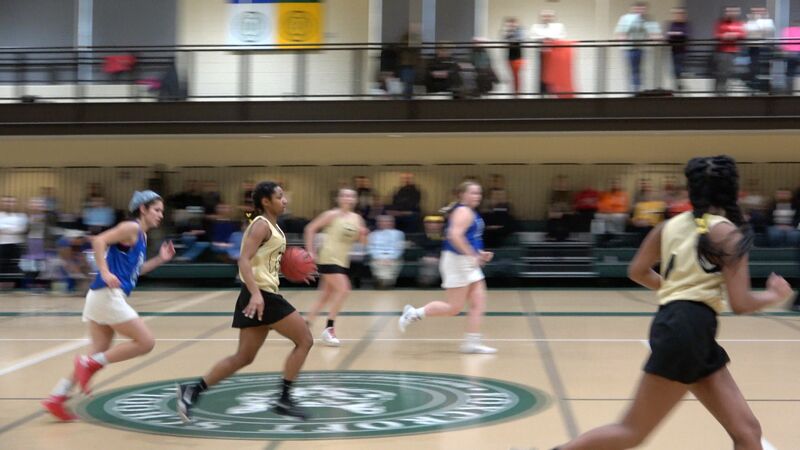 While playing hard on the court, the girls, including Fox Captain Pia S. '18 and Amara B. '19, had fun and showed plenty of joy — especially when Pia hit one of her two three-pointers! Team spirit emanated through the sidelines. Hayden E. '21, Betsy A. '21, Lizzie S. '19, Maria C. '19, and Nell N. '20 were all about the F-O-X-E-S! Both teams cheered loudly and passionately. . .
Fox/Hound events always draw alumnae back to campus. (Back row, left to right) Dawn Dugan Colgan '87, Dody Lilly Hogan '87 (mom of Shea '21), Laura Rhodes Fortsch '87 (mom of Lily '19), Lisa Hubbard Patterson '89 (mom of Remy '22), Chemain Broadway Skinner '87, (front) Lily Wright '11, and Annie Yeager '11 came to cheer for the Foxes and the Hounds. Fox Captain Pia S. '18, here with Head of School Cathy McGehee and mom Laura, was thrilled to have her old sister and former Fox Captain, Charlotte '16, cheering from the sidelines during Big Game. At halftime, Foxes and Hounds both sent another team onto the court — Dance Team! The Foxes showed off their moves. . .
. . .and then the Hounds entertained the crowd. After the final seconds of the game, the Hounds kept The Cup! Big Team Captain Loren S. '19 and Hound Captain Trinity P. '18 proudly raised The Cup to the Hounds after tying on their ribbons for another year. When all was said and done, the essential spirit of Fox/Hound prevailed: True friends to the end! Go Foxes! Go Hounds!